110 interns from across L.A. County. 67 participating institutions. Ten weeks of work experience for undergraduate students or recent grads. 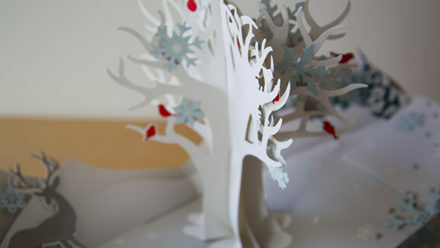 Seven learning community groups across the county, each led by a professional mentor from a local art institution. 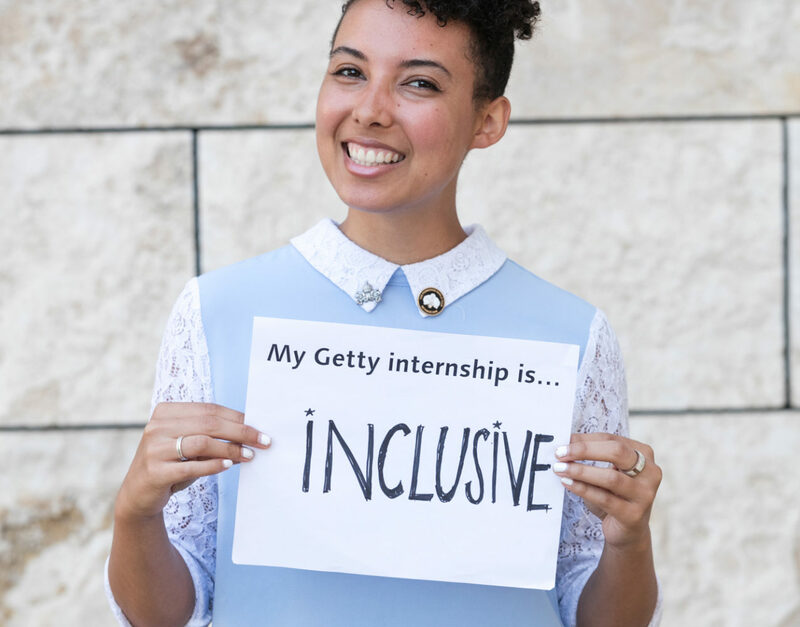 One annual Arts Summit that brings community mentors, influential art professionals, and current Multicultural Undergraduate Interns together at the Getty Center. 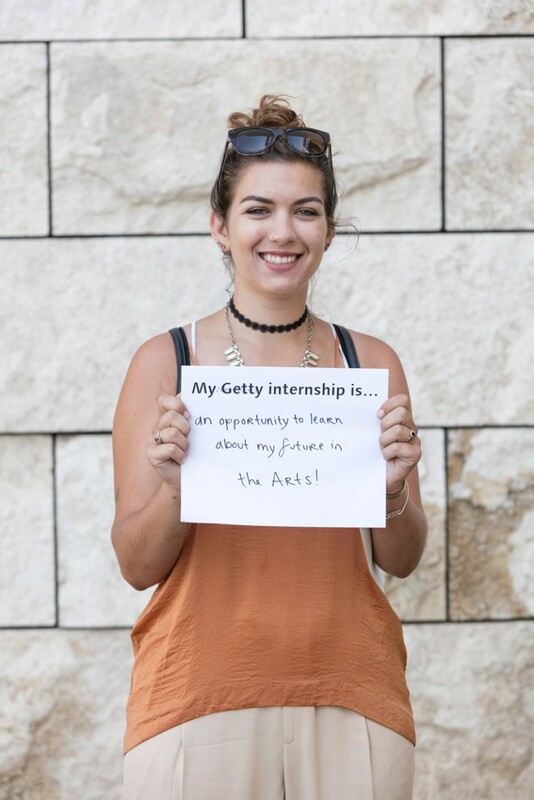 At Arts Summit, these interns working at arts organizations from around Los Angeles County were able to meet fellow recipients of Multicultural Undergraduate Internship grants, network and listen to career advice, and hear keynote speaker Nao Bustamante talk about her career in art. 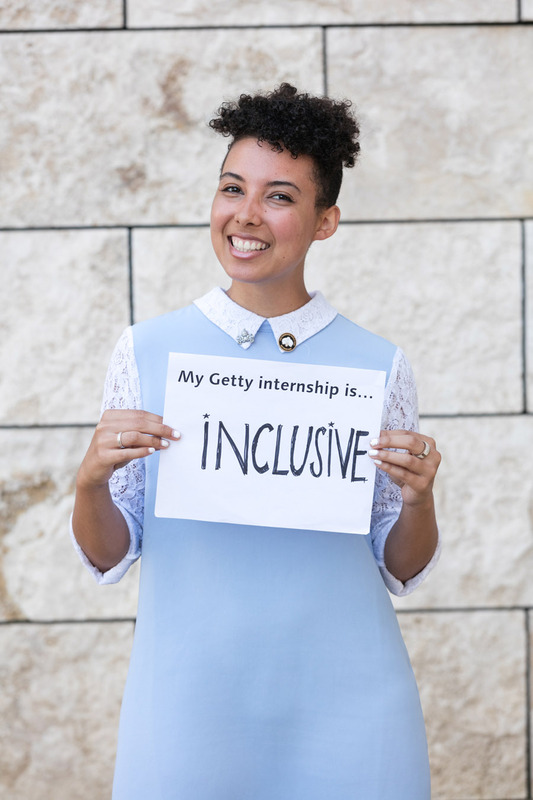 This summer I’m working in the Getty Foundation, which funds and manages the Getty Multicultural Undergraduate Internships. My first week working at the Foundation, I felt excited, inspired, and overwhelmed by the opportunities opening up before me. 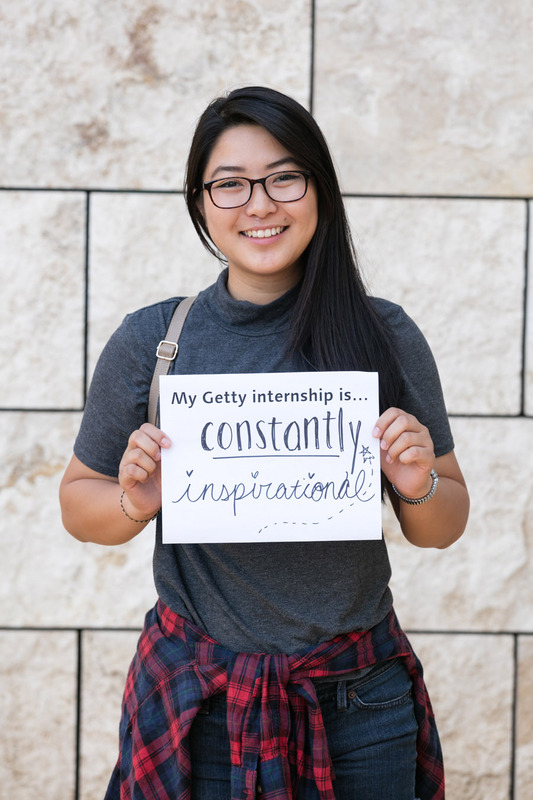 I asked several fellow interns to finish the sentence “My Getty internship is…” in any way they felt exemplified their own experience. I was the first person to take a photo on the morning of the Arts Summit—mostly because I wanted to figure out the portrait setup with the photographer. I described my internship with the Foundation as an adventure because at the moment the photograph was taken, I was tracking down lost Sharpies, making sure the not-yet-used papers didn’t fly away, directing (and taking a lot of direction from) the photographer, and, most importantly, convincing interns to step away from the table full of muffins and scones to take a portrait. 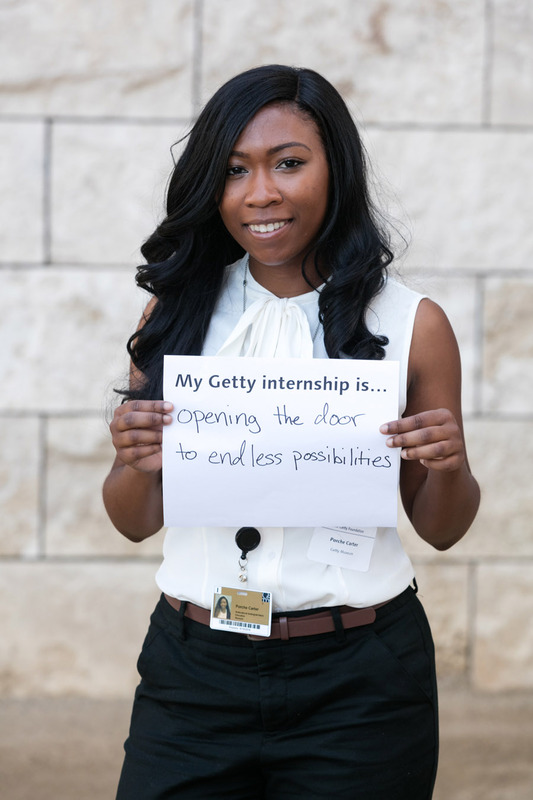 But the freedom to initiate my own projects and participate fully in my organization as an intern is what makes this adventure rewarding and exciting! Here’s what eleven of us had to say—plus a few interesting facts about the 2016 class and the program as a whole. 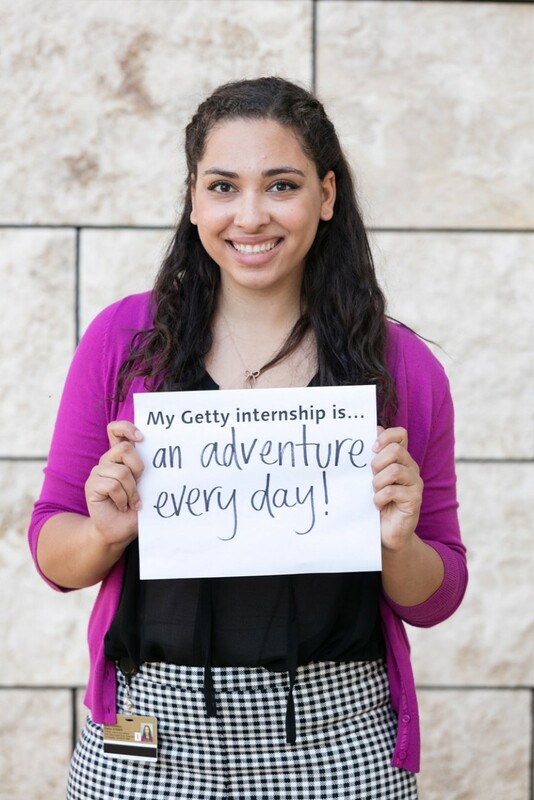 My Getty internship is… an adventure every day! 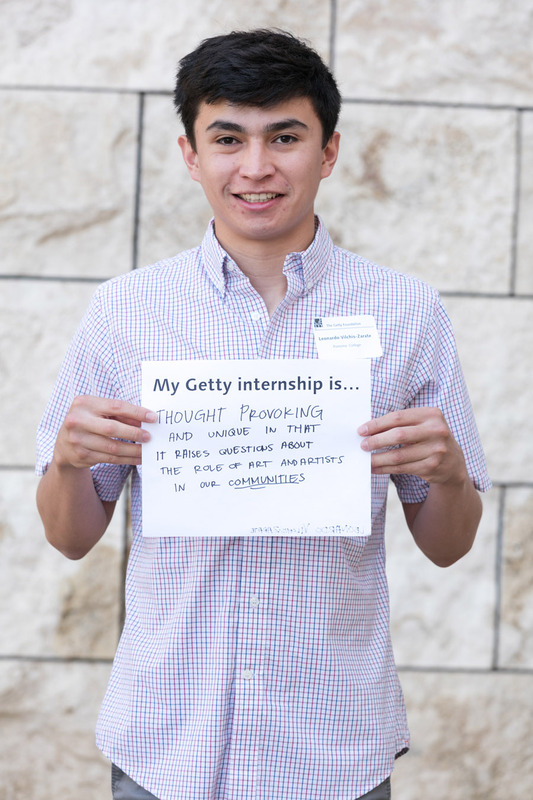 My Getty internship is… an opportunity to learn about my future in the arts! 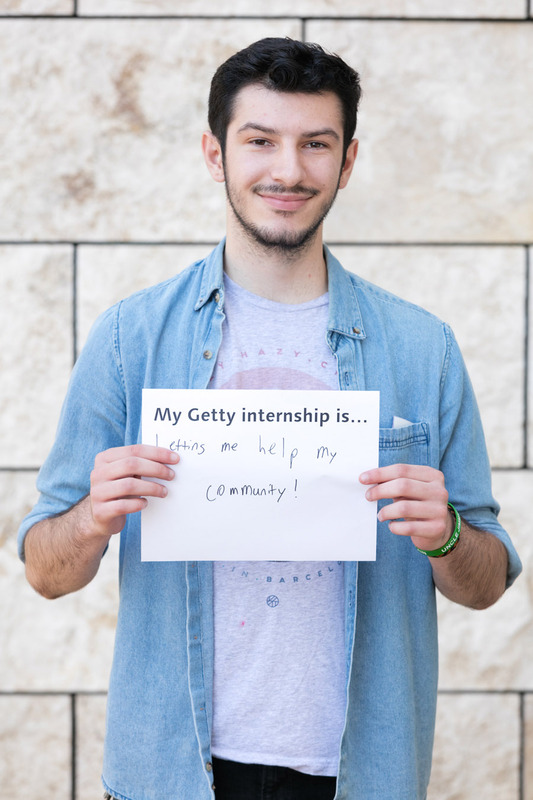 My Getty internship is…letting me help my community! Interns come from schools all over. To qualify for a Multicultural Undergraduate Internship, a student (or recent graduate, like me) must go to school in, or be a permanent resident of, Los Angeles County. So we have students who come from within LA city limits (University of Southern California, Loyola Marymount University) and across California (Pomona College, Stanford University). Students who hail from Los Angeles County, but attend college far from home, are also well represented in internships across LA county. Interns include students or recent graduates from the University of Chicago, Brown University, and, even, University of Toronto! 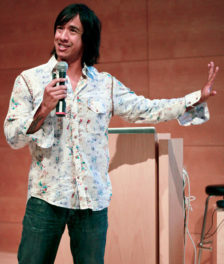 Interns are contributing to the Los Angeles arts community. 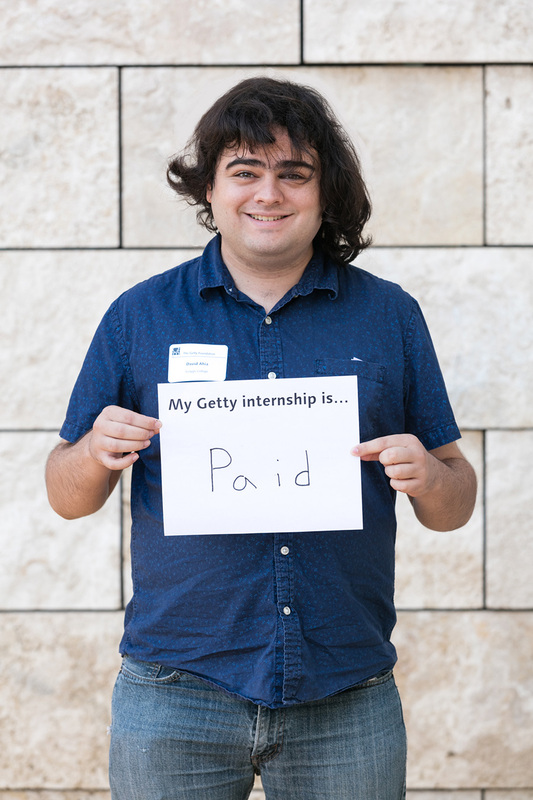 Antranik Tavitian, who works at Ryman Arts, said, “My Getty internship is letting me help my community. 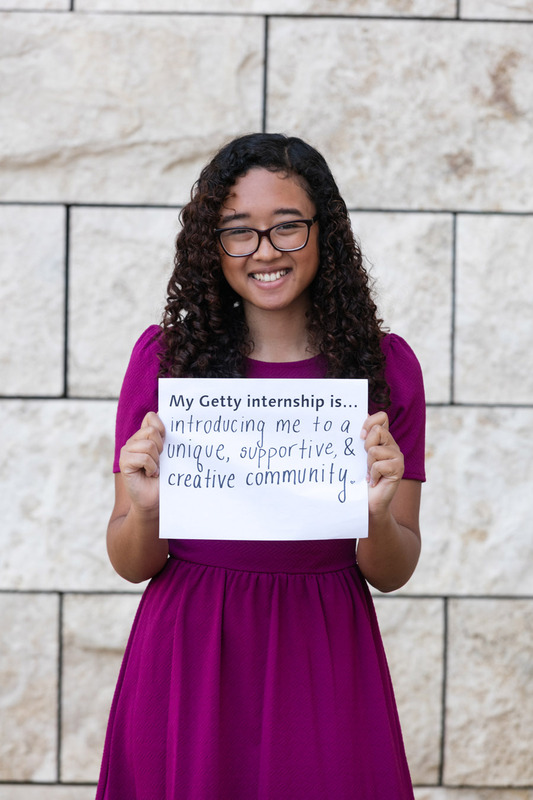 It lets me get involved and have a direct influence on what’s going on in neighborhoods around Los Angeles.” And interns did not forget that they were being paid for all their hard work this summer! Interns are forming a strong community. 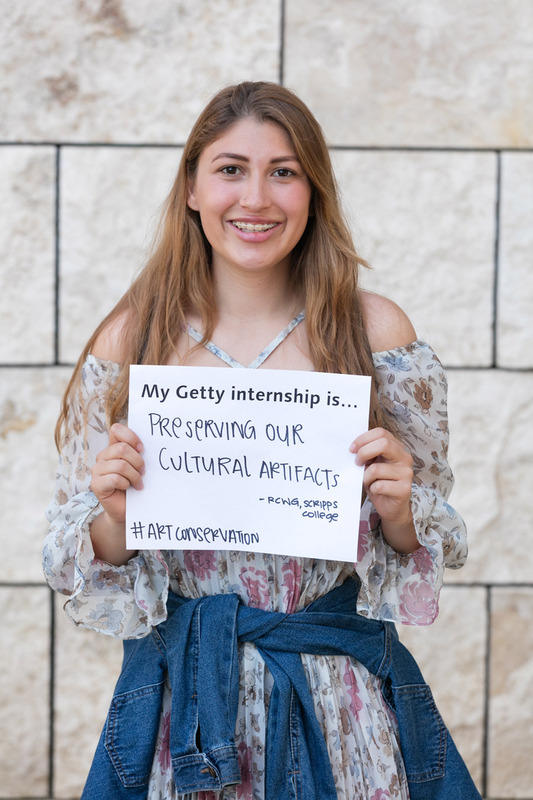 The Getty Multicultural Internship program creates a strong, supportive community for students from cultural backgrounds that have traditionally been underrepresented in the arts. The interns are part of a community that will remain strong well beyond this summer. I can’t wait to see what we all do next! This was a great write-up! It’s cool to see how this program is still going strong. I was an intern a couple of years ago and enjoyed every moment of it. Keep up the awesome work everyone! I would like to know if anyone not on the MUI Facebook page has is organizing meet-ups? We held one earlier last month.